Fig. 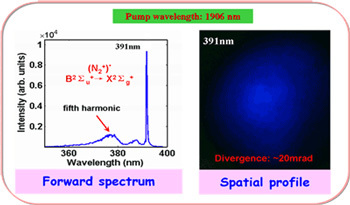 (left) Forward spectrum of air induced by femtosecond laser filamentation with the pump laser at 1906 nm, and (right) spatial profile of the laser emission at 391 nm. In environmental science, it is desirable to generate coherent light sources with different frequencies at a designated position in air, especially for measuring atmospheric trace species and monitoring global warming and stratospheric ozone depletion as well as early-warning of biological and nuclear power plant leakages, which are threats to public and defense security. A collaborative study among professors See-Leang Chin of Laval University, Canada, Huai-Liang Xu of Jilin University, China, Zhi-Zhan Xu and Ya Cheng of SIOM, China, and Kaoru Yamanouchi of the University of Tokyo, Japan, revealed the physical mechanism responsible for the remote laser in air. They proposed a new universal scheme responsible for the population inversion of molecular nitrogen ions and also in other similar gaseous molecular ions. This study was published in Chinese Optics Letters, issue 1, 2013 (COL2013, 11(1),013201). The first realization of remote tunable multi-wavelength laser in air, principally through the excitation of molecular nitrogen ions inside a filament in air by using mid-infrared femtosecond laser pulses, was reported in 2011; however, the physical mechanism was still ambiguous. Remote laser in air is mainly based on the light amplification with air molecules serving as the gain medium. In the reported method, amplification of the seed in the air (N2+) medium was readily achieved by using the self-generated harmonics of the infrared femtosecond pump laser as the seed during filamentation of the pump. However, such a process requires population inversion in the molecular nitrogen ions to be built up within a femtosecond time scale because the self-generated harmonic has an ultrashort pulse duration comparable to the pump laser. In the above mentioned experiments in air, the starting neutral gas molecules are all in the ground state. Generally speaking, population inversion in the nitrogen molecular ion could not be built up by directly exciting the ground neutral nitrogen molecules through highly nonlinear processes, such as multiphoton or tunnel ionization. That is to say, the ground state of molecular nitrogen ions should always be more populated than the excited state. However, inside an air filament of the pump pulse, the intensity is very high, of the order of 1014 W/cm2. This clamped intensity is reached within the ultrafast pulse duration while filamentation and ionization take place. Thus, the ground molecular ions would experience the high intensity inside the filament once it is created. Since the energy difference between the electronically excited states of N2+ and the ground ionic state is a few times smaller than the ionization potential of the neutral molecule, N2+ prepared in the ground state would be ↑ immediately |- further pumped into the excited ionic states through lower order multiphoton processes with very high efficiency. This would immediately result in population inversion in the molecular ions. In principle, any molecular species having similar characteristics would exhibit population inversion. Indeed, this was demonstrated by the SIOM and Jilin University groups in carbon dioxide gas. It is thus proposed that the formation of a naturally population-inverted system of many gaseous molecular ions would be a universal process in a femtosecond intense laser filament. This study provides a new strategy for the generation of remote laser emissions, opening up potential applications of this technique in different research fields.